We’re very proud to say that we partner with charities all over the UK to help us reach as many ex-Forces personnel as possible. In Wales, our base is the Royal British Legion Pop-In Centre on Cardiff High Street – and here you’ll find Julianne, one of our Regional Employment Advisors. Julianne served 21 years in the RAF and agreed to chat to us about her career. “When I was six years old my parents took me to an airshow at RAF St Athan. A WRAF bent down to give me a ‘future pilot’ sticker and told me I had to grow a bit and wait for my front teeth to come back – from that moment it was my childhood ambition to join the RAF. “My parents tried to dissuade me, but I knew what I wanted and 11 days short of my 18th birthday I enlisted at the Careers Office in Cardiff. I originally joined as WRAF and chose to be combatant. Even though they amalgamated with the RAF in 1994 I’m immensely proud of my WRAF status. “My career took me to amazing places and gave me wonderful opportunities. I recruited for the RAF, worked in NATO HQ at USAF Ramstein in Germany, Special Duties in Cyprus, PA to CBF Falkland Islands and operational tours in Iraq. I loved all my postings but particularly loved the Falklands; I was there during the South Atlantic winter and I have never ever witnessed weather like it. It was an honour to go on the battlefield tours of the conflict of 1982 and have the opportunity to see the wildlife – penguins waddling on white sandy beaches, upland geese, dolphins and whales and loads of sheep! I was only there for four months but the friends and memories I made will stay with me forever. 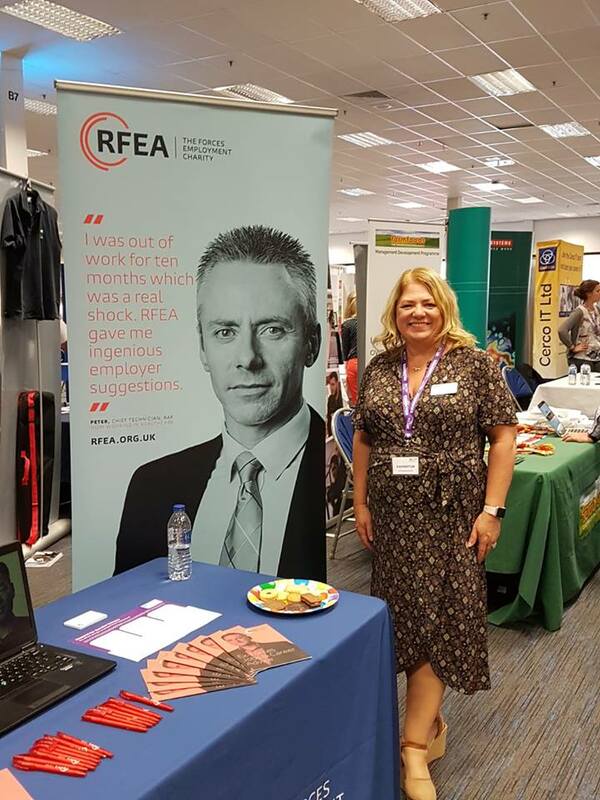 “After leaving the RAF on voluntary redundancy in 2007, I worked for the Welsh Government and as an employment consultant in the Valleys before being appointed to my dream job with RFEA in 2016. I am thankful every day to have a job that I love and the opportunities to help the wonderful servicemen and women that I get to work with. I feel humbled and proud every single day. RFEA would like to thank the Royal British Legion for funding Julianne’s post and helping us reach veterans in Wales.